Wednesday night saw the washed out match from Saturday replayed under the nights with a surprise visit to Crozier Field. Earlier in the day the weather threatened to ruin all the rugby fun again, when Southern Cross Uni shut the fields for use. A couple of phone calls later and the match was back on with the first grade teams kicking off at 7pm. Byron Bay named a slightly changed starting fifteen to the one announced Friday night due to injury, however with the Sand Crabs fixture with Mullumbimby still yet to be rearranged the bench was stacked with talent old and new to the club. 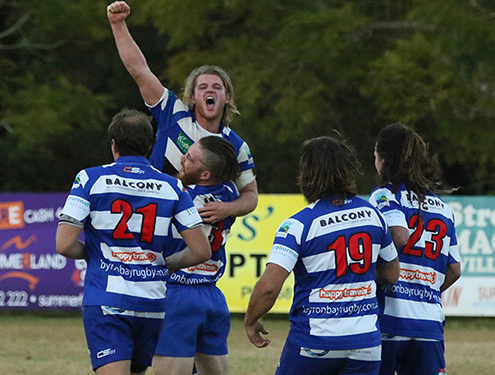 The first 15 minutes saw some good pressure by Byron Bay with much of this time spent camped out in SCUs 22, despite the pressure the first points of the season came in the 23rd minute with a powerful run from the Byron Bay No.8 Dru Baggaley. The conversion was cooly slotted away by new recruit Joel Stocks who made his debut for the first grade side at No.10. After some more pressure and a yellow card for one of the SCU forwards, in the 30th minute Dru Baggaley bagged his second of the evening forcing his away over the line from a pick up at the back of a Byron attacking scrum 5 meters out. The score at half time was Byron Bay 12 to SCU 0. The second half saw Byron Settle into the game and straighten their attacking shape, which proved to much for Uni to handle. Tries from Craig Wallace, Curtis Bradford and another from Baggaley to complete his hat trick sealed the win for the Bay, with three conversions and a penalty kicked by young Stocks bringing the final score to 36 – 0. With all 8 substitutes getting some minutes under their belt it was a great team effort from Byron and spirits were high on the bus trip back to the Bay. “It was a real treat for myself and the other new members of the team to play at Crozier Field for the first game and bag the win. Can’t wait to play the last game of the season there and do the same. Byron Bays first home fixture is fast approaching and will now be the opening game for the mighty Sand Crabs against long standing Byron Rivals Wollongbar Pioneers. Save the date and make sure that you get down on Saturday 7th April. Fist game kicks off at 1:50pm. It’s going to be a big day, with both grades getting new kits, new sponsors, and new players we need to shire to get behind us and support the boys and show everyone what Byron Bay is about. We have a special treat for everyone planned with one of the new sponsors, Skydive Australia, planning a display jump onto the fields to bring the first grade match ball in.